3rd design in the series of Cats in Seasonal Hats! This is Samantha and she wears a beautiful Uncle Sam patriotic Americana top hat! A pretty design to stitch for your July 4th holiday decorating! 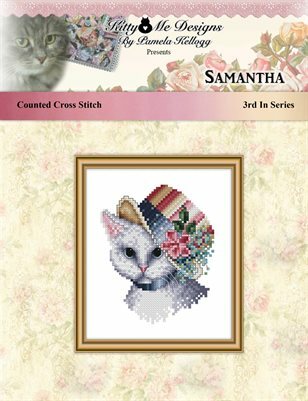 The stitch count for this design is 49 stitches wide X 62 stitches high. On 28 count white Evenweave or 14 count Aida this stitched area will be 3 1/2 inches wide X 4 3/8 inches high. Large print, easy to read black/white symbol chart with colored backstitching lines.